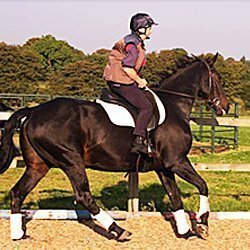 “I am owner of a small rescue and rehabilitation yard in North Shropshire where for most of the time I feed and care for the resident horses on my own, One December day I was turning horses out when I slipped and fell, breaking my right wrist. Obviously this was going to cause real problems at the time of the year when there is a lot of feeding and rugging etc to be done, and as a rescue charity there is never enough money for help. Volunteers were unreliable and never available when I needed them, having their own commitments, so I struggled on for a couple of weeks, getting more and more tired as everything took twice as long. Although I would try my hardest to ensure no horse went without, there was a real risk that Christmas would have to be cancelled that year! I enquired on an internet forum whether anyone had any ideas of how to cope, and someone told me about the Mark Davies Injured Riders Fund. Feeling very undeserving, and despite being fiercely independent, I knew I couldn’t carry on and asked them for help. They were so very helpful and could see how difficult I was finding it to run the yard, and so approved a grant of enough money to enable me to look for and engage some help locally, to tide me over until I was fully functional again. Without this help I don’t know what would have happened – I couldn’t carry on for much longer as things were, but with the help of an experienced local groom, paid for by the grant, horses got fed, haynets got filled, and all the other daily chores got done twice a day so that none of the 8 horses in my care went without.